It seems unlikely that any environmental good could derive from the use of persistent organic pollutants such as PCBs and chlordane. But that's exactly what VIMS Professor Rebecca Dichkhut is attempting in her latest research. Dickhut, Chair of Physical Sciences at VIMS, is using these contaminants to help measure the degree of mixing between Mediterranean and western Atlantic stocks of bluefin tuna—a finding with important implications for management of the bluefin fishery. The Atlantic bluefin tuna, Thunnus thynnus, is a highly migratory species that supports a fishery throughout the North Atlantic and Mediterranean. This lucrative international fishery is driven largely by the Japanese sushi market, where a single fish has sold for more than $150,000. But the bluefin fishery is in trouble. ICCAT, the International Commission for the Conservation of Atlantic Tunas, reports a rapid decline in bluefin abundance during the last few decades due to severe over-fishing. The species was listed as endangered at the 8th Convention on International Trade in Endangered Species of Wild Fauna and Flora in 2003. An important question in bluefin management is whether the bluefin population comprises separate western and eastern stocks, as early observations suggested. According to VIMS Professor John Graves, Chair of the US Advisory Committee to ICCAT, the two-stock hypothesis was founded on discontinuities in catches across the North Atlantic and the presence of two spawning areas, the Gulf of Mexico and the Mediterranean. ICCAT manages the fishery based on the two-stock premise, with differing regulations on either side of the Atlantic. Catch limits for the Eastern stock (fished in the Mediterranean and eastern Atlantic) were recently reduced to 29,500 metric tons per year. The western stock, which has been subject to a recovery plan adopted by ICCAT in 1998, has much lower catch limits of around 2,100 metric tons per year. As might be expected, the disparity in catch limits on either side of the Atlantic has led to contention between commercial fishing interests in the two regions, particularly in light of recent tagging and genetic studies suggesting that bluefins from the eastern and western Atlantic mix on the Atlantic fishing grounds. Dr. Jens Carlsson, a post-doctoral researcher in Graves' lab, writes in a recent paper that "The extensive trans-Atlantic movements and lack of significant genetic differences between the putative populations of bluefin tuna have led researchers to question the validity of the 2-stock management approach." Although Carlsson's studies of young bluefins support the two-stock approach by showing that genetic differences do exist between eastern and western stocks, continued uncertainty surrounding the species' population structure has led to a broad effort to further clarify the relationships among bluefin populations in the Gulf of Mexico, western Atlantic, eastern Atlantic, and Mediterranean. Several studies, including Dickhut's project and a follow-on genetic study by Graves, are funded by the Large Pelagics Research Center at the University of New Hampshire, in partnership with NOAA's National Marine Fisheries Service. The Center's grants reflect the science community's interest in developing novel methods of tracking tuna to supplement conventional tagging studies, which suffer from both high costs and low rates of recapture of tagged animals. Dickhut's two-year study aims to clarify the stock question by measuring the ratio between PCBs and chlordane in bluefin tissues. PCBs are manmade chemicals that were used in electrical equipment around the world starting in the 1930s. They were banned in the U.S. in 1977 because of evidence they build up in the environment and can cause cancer; an international manufacturing ban followed in the 1980s. Chlordanes are a class of synthetic pesticides that were used in the US from 1948 to 1988 to treat field crops and control termites. The EPA banned all uses of chlordane in 1988 due to environmental and human-health concerns. Both PCBs and chlordanes persist for decades in the environment, and can reach the open ocean through river runoff or the air. They accumulate up the food chain, reaching levels in bluefin tuna and other top predators that may be thousands of times higher than in water. The key to Dickhut's investigation is that PCBs were used in both Europe and the US, whereas chlordane use was restricted to North America. "The food web in the Mediterranean doesn't have much chlordane," says Dickhut, "whereas the food web along the US coast has a lot. So what we expect to see is differences in the ratio of PCBs and chlordane in animals from these areas. We're using the ratio as a tag, exploiting the difference in order to track these fish." Her preliminary look at bluefin tunas from the Gulf of Mexico showed that they have a relatively low ratio of PCBs to chlordane, a finding that supports the prevailing notion that two Atlantic stocks consistently return to different spawning grounds. "The idea," says Dickhut, "is that only Gulf of Mexico fish go back to the Gulf of Mexico [to spawn], and only Mediterranean fish go back to the Mediterranean, but any fish caught along the coast of Virginia or anywhere in the Atlantic could be from either side. We're trying to figure out how many fish from that side might be over here, and vice versa, by looking at stock mixing." 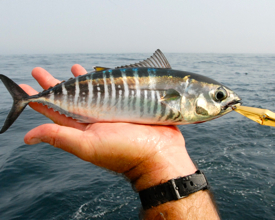 Dickhut has begun studying mixed stocks by sampling fish from the western Atlantic, including the coast of Virginia. The PCB-chlordane ratios in these fish are more variable, consistent with the idea that some may have migrated from the Mediterranean. None of these fish show the drastic difference one might expect given the lack of chlordane in Mediterranean waters, but Dickhut says this result really isn't that surprising. "If a fish was feeding in the Mediterranean food web and incorporated that signal, but then swam across the ocean and started feeding here, it's chemical signal is going to start changing to look more like a fish from over here." By using a mixing model, Dickhut's team has estimated that these fish had formed about 65% of their body tissues while in the Mediterranean, and 35% during their time in the Western Atlantic. Dickhut's next step is to analyze tissues from Mediterranean bluefin tunas. She hopes to sample younger fish to lessen the possibility that they may have skewed their "native" PCB-chlordane ratios by spending time in western Atlantic waters. Her team is also refining a new laboratory technique that will allow them to measure several different chlordane compounds. "We spent the summer getting a few other chlordanes to use as markers because we want to have multiple ratios to make our work more defensible," says Dickhut. "Our work is ongoing and hopefully we'll have a cleaner, clearer story with our new analytical method."